San Diego, CA - Old Town San Diego State Historic Park is the historic heart of San Diego. Created in 1769, Old Town San Diego was California’s first settlement with only a mission and a fort. Link to Photo Without Frame Thank You for Making this Daily Photo the # 2 Pick on 02-10-2018. Superb capture of this street scene. 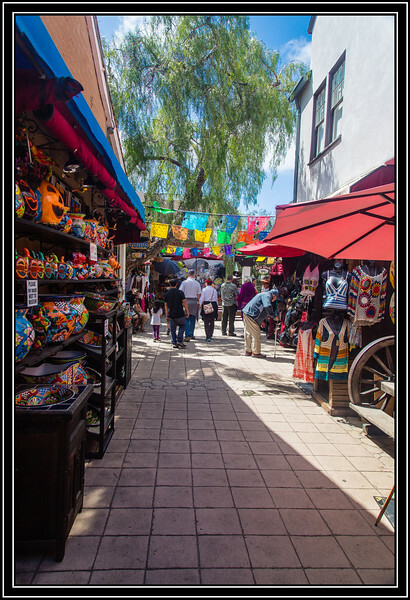 I guess I missed this spot in Old Town--it reminds me of Olvera Street in Los Angeles. Very nice street scene. Lots to see. A familiar market scene ! Colourful street scene; like how the eye is drawn to the big tree!